A better way to care – Good Practice Good Health Inc.
Over 500 people in Gippsland attended the six events of the 2017 Gippsland Health Summit in Sale at the end of March, culminating with seventy health professionals and people with lived experience sharing their expertise on Friday night and Saturday, at the conference. Earlier in the week, the communities of Sale, Leongatha and Orbost watched the play Out of the Blue about preventing suicide. These discussions with the community were raw, personal and caring. Research shows that talking about our feelings and our experiences of pain and distress make a difference to people’s well-being, and this was supported/reflected in the emotions evoked by the play, and the personal stories that were subsequently shared on the night. The message was clear – all community members need to keep following up people whom they are concerned about and if you are in distress find someone to talk to – Lifeline, a friend, a professional. Stigma will only soften, language will only be able to empower and to open up the conversation, when we keep educating each other and when we keep trying. The most important thing we can do, whatever our position in our community, is to keep asking each other if we are ok, to keep inviting each other to participate and never to give up! A beautiful comment from Andrew Cawood of Lifeline at the Leongatha event really resonated with me. Andrew said “asking for help is the most normal thing to do – our species depends upon it (paraphrased). I hope that our events have helped to normalise the experience of being human and to look out for each other. On Friday night at the public event, Boost Your Brain, Dr Helena Popovic shared her 20 brain boosting tips with 150 community members to rousing applause. Some of her scientifically proven tips were to reduce your time sitting to less than four hours a day, to prioritise 30 minutes of exercise each day, to have a conscious practice of gratitude every day, to smile and laugh and to stay socially connected. For example, half an hour of exercise every day, halves your risk of developing dementia! Dr Helena is an inspiring and entertaining speaker. People at the forum described her presentation as “wonderful”, “motivating”, even “I’m blown away with what I have learnt about preventing dementia here with Dr Helena”. We hope to see her again in Sale in 2018 so please keep in touch via our Facebook page. At the professional networking dinner A/Prof [Associate Professor] Munjed Al Muderis shared his knowledge as an Orthopedic Surgeon with us. Munjed is a world leader in the field of osseointegration – a ground-breaking method of attaching prosthetic/robotic limbs to amputees that was more functional and enabled previously wheel-chair bound patients to be able to walk again (or something like that – summarise what osseointegration is – I’m not exactly sure whether Munjed calls it a prosthetic or robotic limb so you might need to check). He inspired us with what is being achieved in robotic limbs, to give amputees their life and their hope back! Munjed described how his team works together to achieve cutting edge results for the people they work with. He described how even if the person’s situation is not appropriate for the surgery his team offers, they will work hard to inspire hope and to encourage the people who come to consult with them, creating goals and providing information that the person can work with for their future. Munjed has had an extraordinary life to date, including arriving in Australia as a refugee in a boat. He reminded us that everyone has a story that ought be respected and honoured. He reminded us what the Hippocratic Oath really looks like from a position of lived experience. One participant described his talk as a “refresher in empathy” and another as a “very insightful presentation on coping’ “. Fantastic conversations were shared at the professional conference, led by expert panels. These ‘experts’ included not only high-profile visiting keynote speakers and leading local health professionals, but also local people from the community, courageously sharing their lived experience, with the public and health professional audience. The conference was opened by psychologist and local identity Ms. Jeanette Gibson OAM and her granddaughter Kristen Priestly, discussing their experiences of being a patient and support person in the health system, as Jeanette responds to her diagnosis of cancer. Jeanette and Kristen reminded us that working on complex health problems require all the parties to meet in the middle, to listen carefully to each other and not to assume anything. They also reminded us that unconscious bias is in us all, and can significantly impair a person’s capacity to heal. Obstetrician Dr Vijay Roach, led our discussion on perinatal health and encouraged us to bring kindness, love and care to all situations. He challenged Jeanette and Kristen’s meet-in-the-middle invitation, saying he believes health professionals need to come all the way over towards the patient when it comes to understanding and communication. This was also brought out in Liz Meggetto’s workshop – she reminded us that health literacy, speaking in plain language, is the responsibility of the health professional. It is incumbent on the health professional to learn ways to communicate that can be understood by all patients and their families. Vijay described working with his patients as an opportunity to care for them and said that listening to the patient’s story is the best way to learn how to do that. Similarly, Christine Hoyne from the Parent-Infant unit at Latrobe regional Health, has a very clear focus that families coming into the residential program with their small baby need a place of hope and a sense of safety first, before they can begin the process of healing and learning. Trust and safety came up again in the presentation on youth mental health by A/Prof Sarah Hetrick and Dr Magenta Simmons from Orygen Youth Services. Sarah and Magenta told us that 75% of adult mental health issues have their origins between 12-25 years of age. The suicide rate and this figure make it clear – the onus is on us as health professionals to make young people feel comfortable enough to join the conversation and to open up. Like Vijay, they talked about creating the right environment for sharing what’s really going on with the people we work with, using a framework called Shared Decision Making. Both perinatal and youth conversations promoted the use of screening tools and the ongoing research and modifications being done to optimise their effectiveness. Casey, Elise and Emma represented people with lived experience during these sessions and we all remembered that lived experience is expertise. Dr Andrew Roberts, GP, encouraged us to set up scenarios in our care-giving that keep people coming back. Over and over again, the take home messages were that of establishing rapport, trust, safety and hope. And psychiatrist Dr Somoyu Basu acknowledged that we have learnt from past mistakes with a more collaborative approach, which has led to more effective results in working with young people. Our conference also included a Healthplays performance of My Dog Has Stripes. This play is about depression and about professional self care. This, along with another presentation from Dr Helena Popovic, stimulated us to acknowledge the very real challenges of our work in health. Helena asked us “at what temperature are you living your life?” and suggested that the speed of life is robbing us of self care and of care to others. One of my favorites, was her saying “emotions are real energy” and I wondered why we tell our clients it’s okay to cry or to be frustrated for instance, yet we suppress expression of these feelings in ourselves. Towards the end of her workshop, Helena quoted actress Lily Tomlinson saying “for fast acting relief try slowing down”. She also reminded us that to be exuberant could be a collective choice. Our week of events was, in a way, a pause for those who joined the conversation. People from twelve different professional groups and community members, including farmers, rural financial counsellors, teachers, shop assistants, people who look after families and carers, among others, came together to discuss mental health and patient-centred care. We spent no time or energy talking about the lack of resources and lots of time talking about what a difference we can make by listening, by making time and space that feels safe and by being curious about what the people, whom we are working with, really care about and what they really want. Collectively, the feedback was incredibly encouraging. These conversations do make a difference to how we deliver health, to how we protect ourselves from burnout and to how people experience entering the health system when they are feeling vulnerable and disoriented. I am filled with joy and hope about what we can achieve when the whole community joins together to provide and receive health care. Listening, being curious instead of assuming and recognising the impact of an effective team working together, are the lessons I take from the 2017 Gippsland Health Summit. There are no experts and we are all experts – I hope I can honour that every day in my work as a health professional. Thank you to every person who planned, delivered and participated in the Gippsland Health Summit. Thank you for continuing to teach me and in keeping me accountable, we really can do health care better as a team and I love learning how to do that alongside, with you. Sharee Johnson, Psychologist and Founder of good Practice Good Health Inc. The Gippsland Health Summit was presented by Good Practice Good Health and supported by many local organisations. For more information about the GHS2017 and to find out about future events visit www.gpgh.org or follow Good Practice Good Health on Facebook. 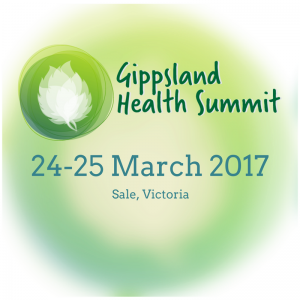 ← Gippsland Health Summit … Why? What is it?